Zorbing: (also known as globe-riding, sphereing, or orbing) is the act of rolling down a hill in a large, inflatable plastic ball for recreation or sport. 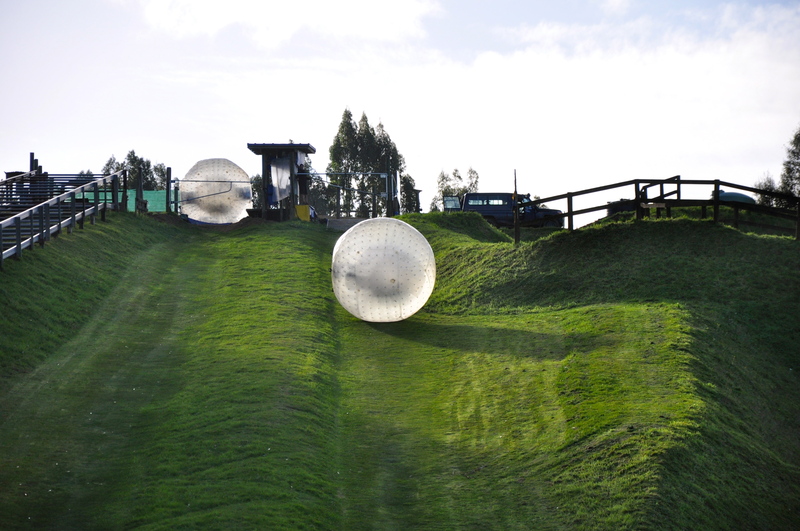 About 15 years ago, this experience was invented in New Zealand when two crazy Kiwis decided it was a good idea to roll down a hill inside the newly developed zorb globe. Obviously, this was an extreme sport that Coley and I knew we must try during our time in Rotorua. Despite the fact that it’s currently the middle of winter here in New Zealand, we threw on our swim suits and opted for the hydro ride. This means that that we had no harness and both of us were in the zorb globe at the same time with nothing but about 3 gallons of water. 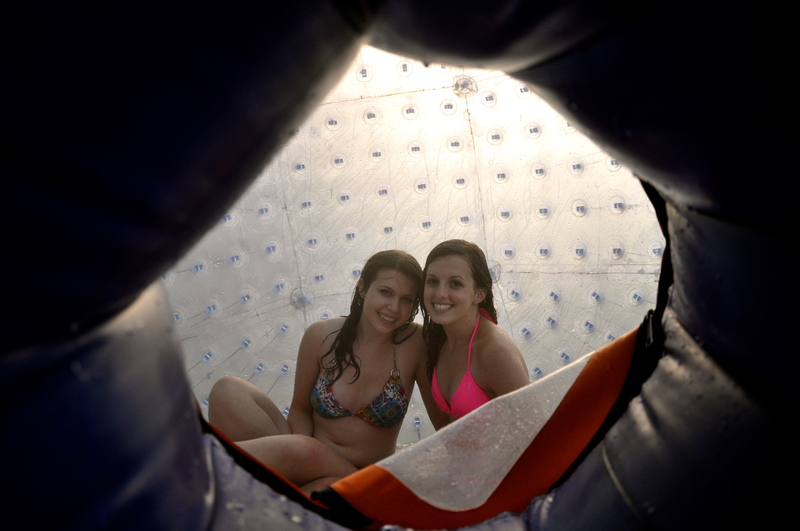 We literally had to dive into a small hole in the ball and waited until we were released down the hill. I think we can both agree that this was one of the craziest and most fun experiences we’ve had in our lives. 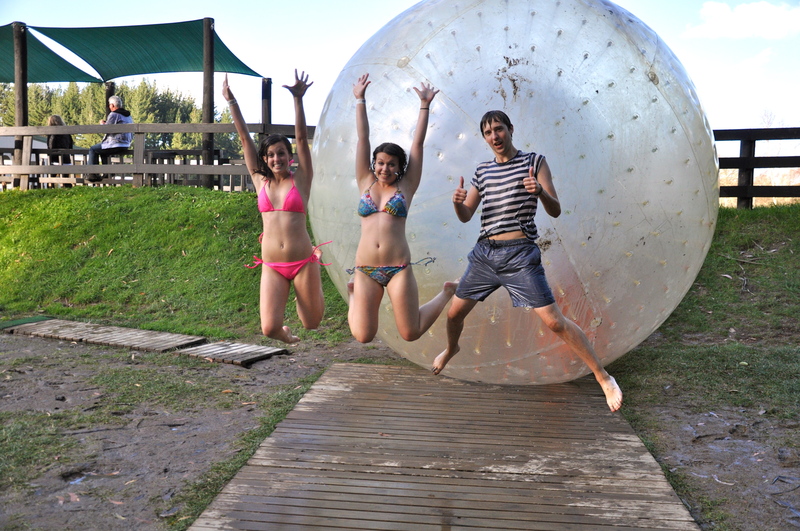 The best way to describe the zorb ride is somewhat of a a cross between a roller coaster and a waterside. Imagine us being socks in a washing machine. From inside, we couldn’t see anything as we rolled down the hill, slipping, spinning, and sliding everywhere at about 30 miles per hour. After our ride, I ran into the office and enthusiastically told the manager how incredibly awesome I thought that experience was. To which he replied, that he’d let us go again…for FREE! We did the hydro ride again but this experience was quite different because Coley and I went in the globe with an English bloke that we just met (we didn’t even know his name until after the ride). We challenged ourselves to stand up but with the weight of three people in the ball, we were rolling at extreme speeds and immediately fell down. We spent the rest of the way down the track slipping, sliding, and spinning even more than the first time. More people = more insanity. It was wet. It was wild. It was completely unlike any other adventure. Posted on June 25, 2011, in Destinations, New Zealand and tagged Adventure, backpacking, Coley Nelson, Kim Pitingolo, Magic Bus NZ, new zealand, rotorua, Travel, zorb, zorbing. Bookmark the permalink. 4 Comments. Kim Your blog is awesome. That is the same goal of my blog….to get other people to step out of their “comfort zone” and explore the world. I remember not long ago you messaging me about Australia! Glad to see you have done so much. You are a great writer!!! This is really good is it ok if we put this on our Zorb site.I am realty glad to be the manager to let you go for free. But it was because you guys were on the stray bus… We look after the stray passengers. Sorry guys it was the magic bus. Peter, thanks for your comment. You’re more than welcome to post this on your website. Thanks again for a great experience!